Bob Saginowski (Tom Hardy) is thinking about taking in a stray pit bull. He runs this idea past the owner of the bar he tends, his cousin Marv (James Gandolfini), noting that that adopting this dog would amount to an awful lot of responsibility. Marv looks at him like he’s just announced his intention to enroll in astronaut’s school. It’s not a long lost relative who’s just shown up with a colonoscopy bag, Marv explains, it’s a dog. It’s just…a dog. And Bob gets this faraway look in his eye, like his brain is waiting to process what his ears just took in. Finally, he mumbles “Yeah.” And in that “yeah” lays the entire subdued, even sluggish, yet no less commanding lead performance of Tom Hardy. It’s a performance in which he seems to be playing the perfect hand of acting poker, leading us to believe his character is this way for ninety minutes before laying down a flush by way of saying no, he’s actually this way. And yet, and this is the most amazing thing, even when he’s laying that flush, you’re not entirely sure if the character as he plays it was bluffing everyone or just being who he is the whole time. Hardy is noted for his devotion to voice acrobatics, shifting and re-shaping how his voice sounds for reach role, and it’s fairly incredible to see the same man who gave birth to the discordant oft-unintelligible terror of Bane could manage such an impressive turn and yield the rambling, confused, spacy Boston accent of Bob Saginowski. Whether or not it’s an “accurate” Boston accent I am in no position to say, but it’s not ineffective, a mouth full of purposeful marbles. Hardy seems to physically shrink to match that voice, a man who blends into the bar he tends, head tilted a little low, a little embarrassment hung around his neck at all times, maybe because he’s a little slow on the uptake aside from taking in drink orders. He is tinged with a bit of Sly Stallone’s polite reticence as Freddy Heflin in “Cop Land”, but with so many more tricks up its sleeve. Bob is on the other side of the law, after all. Marv’s bar is mixed up with some Chechen mobsters who actually own the place, laundering money through this working class dive, and when the joint gets robbed, the mobsters pay a coolly menacing visit. Marv is on edge, and the late Gandolfini outfits the character with that sort of aw-shucks desperation to their face and I’ll-Show-You fronting behind their back. Hardy in these scenes, however, is something else, playing it like an oblivious idiot who cannot comprehend the gravity of the situation, talking through things out loud. You’d expect him to get shot if you couldn’t tell that everyone didn’t feel sorry for him. Nadia (Noomi Rapace) seems to feel sorry for him. She’s Bob’s obligatory love interest, their Meet Cute happening around the trash can where Bob first finds the stray pit bull. And when he tells her he’s never taken care of a puppy and doesn’t know what he’s doing…well, Hardy encapsulates the term “wounded puppy dog look” as well as any actor ever. How could Nadia not help him out? How could she not sort of fall in love when she sees him get all twisted up in the dog’s leash, like using a leash is some sort of unsolvable geometric equation? She seems more resilient than him. That’s just the thing, though; this performance, this character, has hidden layers, waiting to be excavated, and the real Reveal here has nothing to do with revelations of Marv being in on the robbery of his own bar and the psychotic ex (Matthias Schoenaerts) of Nadia’s who comes calling for Bob and for the pit bull; no, it has everything to do with Bob’s true nature. When Marv backs over a guy to keep him quiet about what’s really going down you hardly bat an eye because the whole sequence is cut and pasted from a thousand other movies. But when Bob rises to the occasion at the most delicate of moments, it’s jarring because you weren’t entirely sure he had that in him. And you weren’t entirely sure because of the way Hardy has played him throughout. The way in which Nadia looks at him in the aftermath, is how you’re looking at him. It’s like “The Sixth Sense” and you want to re-wind and go back and check to see if anyone else did acknowledge Bruce Willis’s presence. For real? For real. 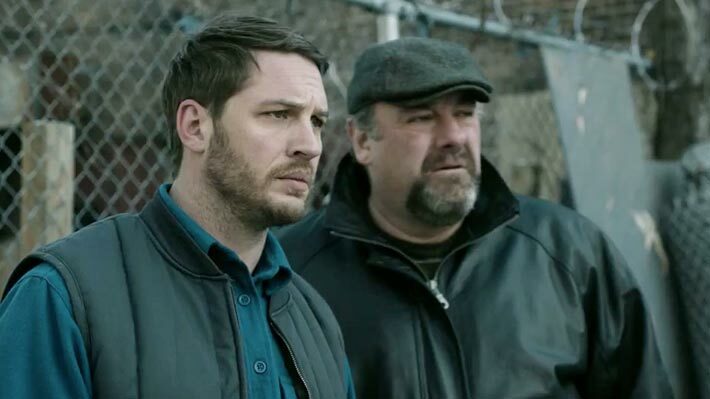 At “The Drop’s” conclusion you’re convinced Bob could pass even the CIA’s most rigorous lie detector test; Hardy too. Hey, thank you! That's a great description of how they play the reveal too. The film itself is very much a genre picture, which isn't a bad thing, but it's definitely Hardy that elevates it.